It is a computer-generated image that graphically represents the behavior of a mathematical equation. It is like a snapshot of a mathematical object that would otherwise be invisible. Paul Lee writes, "Fractals are extensions of traditional Euclidean shapes, such as lines, squares, and circles, with two fundamental properties. First, when you view fractals, you can magnify them an infinite number of times, and they contain structure at every magnification level. Second, you can generate fractals using finite and typically small sets of instructions and data." Here is the definition given in a FAQ: "A fractal is a rough or fragmented geometric shape that can be subdivided in parts, each of which is (at least approximately) a reduced-size copy of the whole. Fractals are generally self-similar and independent of scale." There is high quality explanation of fractals on the following video. What is special about fractals? The two features that stand out are their complexity and "self-similarity". The latter refers to the fact that when a fractal is enlarged ("zoomed into") then the resulting image is usually similar to the previous one, sometimes almost identical. Note that a fractal has infinite granularity in that one can zoom in without limit (at least in theory) to show ever finer detail. This is equivalent to making the spatial range smaller and smaller. Fractals mimic some of the shapes found in nature. As in nature, fractals rarely have any straight lines. The most typical shapes are the spiral and the Mandelbrot - a circle with a dip, with smaller circles hanging off it. The other, and for me the most important, feature of fractals is that some of them are beautiful. Two motives for making them are the search for beauty and simple curiosity. Making fractals is a way of exploring the natural world, akin to collecting crystals or sea-shells, only far richer and more active. You may be the first person in the world to see a new and fascinating shape. It is as though a non-human artist is drawing images for you, unconstrained by any human notions such as subject/background, balance, perspective or color combinations. For me, the appeal is to create an image with new and interesting structure. 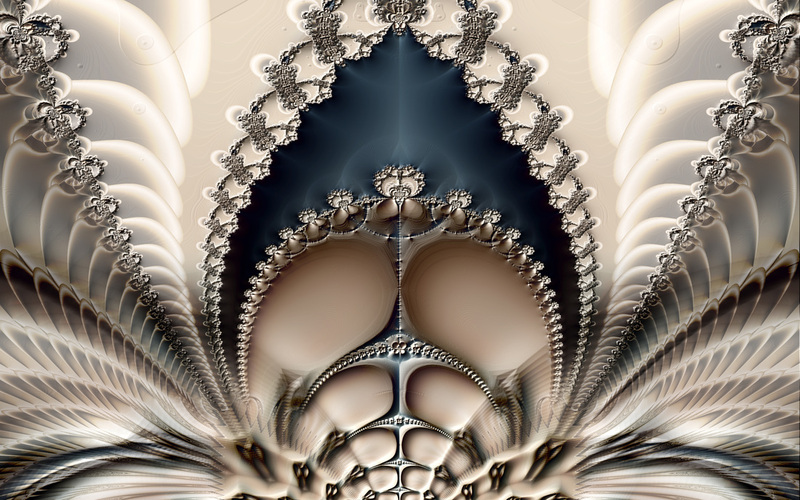 I see fractal-making as entering new worlds unknown to man (or even woman). Who invented them, when, where and why? During World War I, a French mathematician called Gaston Julia was probably the first to draw a fractal. Benoit Mandelbrot is normally seen as the father of fractals. He played a pivotal role in the development of the branch of mathematics called "chaos theory", the study of very complex dynamical systems. Such systems are characterized by sensitive dependence on small changes, a small change can cause a surprisingly large effect. Fractals are used to model the behavior of complex and almost unpredictable systems such as the weather and earthquakes. Where are fractals seen in nature? Fractal shapes are seen in fern leaves, sea-shells, snow-flakes and coast-lines. Just look and you will see it all around.